Alright, am I going to fall in the Triple D's deathtrap of mediocre food again? You see, whenever a restaurant is featured on TV, it always seems to draw a lot of people. Make sense, publicity is the best thing for most businesses. However, when publicity overrides good taste, then we have nothing more than the novelty factor. Granted, some of the places I've visited that have been featured on the Food Network have been solid. So it really is a crap shoot. Being in San Diego, there were several "featured" restaurants to choose from; but the reviews from Yelp and Urbanspoon warned me enough to avoid them . 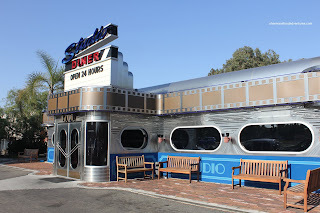 However, I didn't shy away from Studio Diner since it was kid-friendly and worked with our schedule and location. After a day in La Jolla, we tried to go for dinner at the Cottage. Epic fail. They are closed on Sundays for dinner. 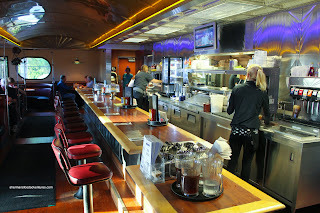 So we altered our plans a bit and traveled East to Studio Diner. At first, I thought we were in the wrong place since everything was industrial. Not a place you'd typically find a restaurant. Ah, but there it was, in its gleaming chrome glory. You see, the aptly named Studio Diner was established to feed the cast and crew of all the TV shows that were being produced nearby. 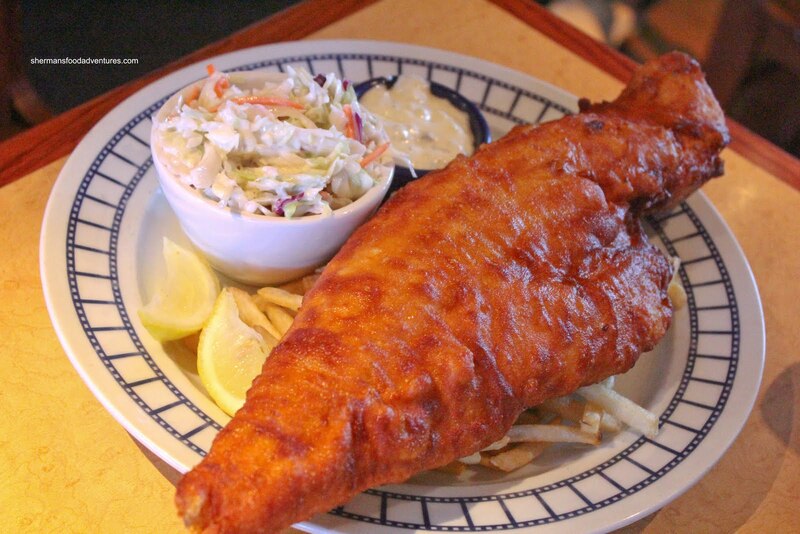 Ultimately, it has attained a form of celebrity status as a destination restaurant. We arrived fairly early for dinner which meant no lineup. Alright! Another restaurant with no lineup. That makes for a much easier time with 2 hungry and tired kids. The place certainly has its charm. From the inside out, the place screams diner. One look at the menu and there are the familiar greasy diner favourites as well. 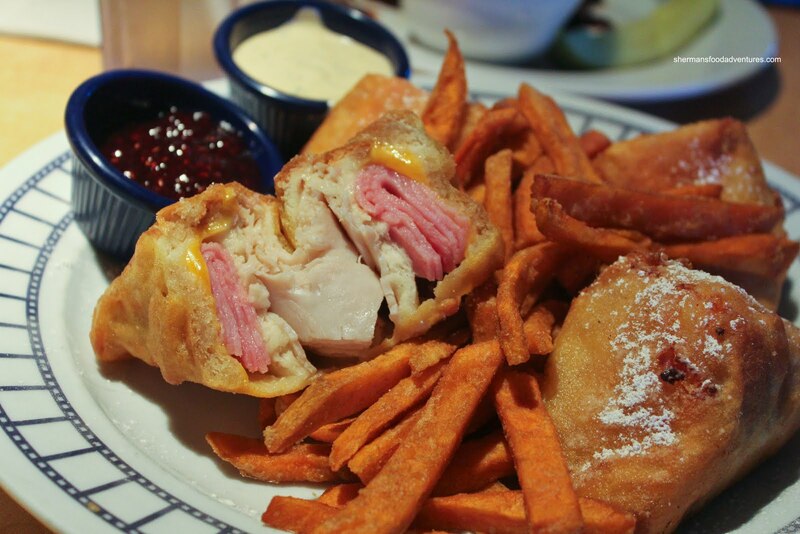 I asked for suggestions and settled on the Count of Monte Cristo. Great, a fried sandwich. Goes well with the 1/2 burger I h ad for lunch and cookies I got from the Cravory. I need to eat salad for the next month to purge the last week of food. Although there was plenty of turkey, ham and Swiss & cheddar cheese stuffed in the 4 fried pieces of sandwich, it sounded and looked way better than it ate. Don't get me wrong, it was not bad; but it was really greasy. Yah, yah, I know it should be, so don't flame me. It was just too much fried goodness. On the other hand, I really liked how the raspberry jam went with the sandwich. It somewhat cut through the grease and saltiness a tad. I substituted for Yam Fries and they were executed wo nderfully - crisp and sweet. Prior to that I had a bowl of Clam Chowder to start. Other than a good amount of plump, tender clams, there was nothing much else in it. I found the broth to be slightly on the salty side; yet it was still tasty. The one thing that really bothered me was that the soup was served lukewarm. 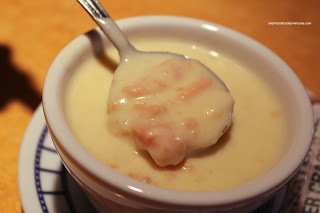 For me, that is very unappealing, especially for a cream-based soup. 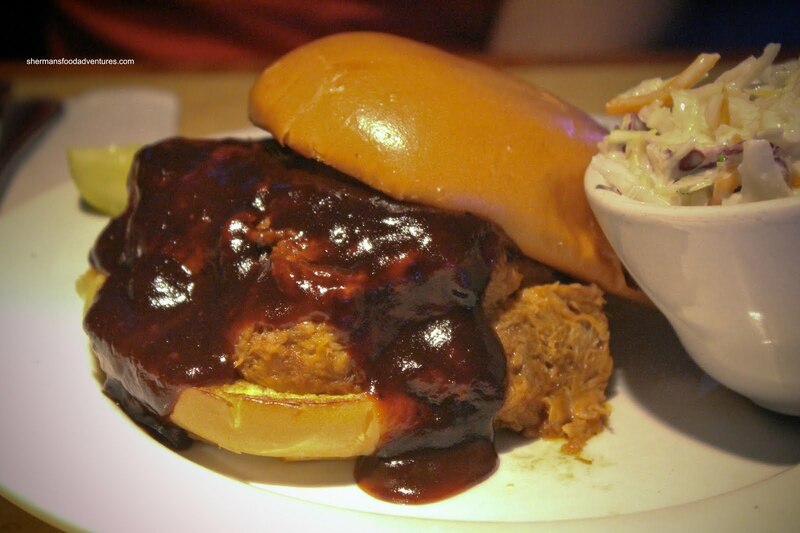 As for Viv, she had The Babe which was a pulled pork sandwich with Randy Jones BBQ sauce. This was not bad. The pork was plentiful and definitely moist an d tender. The BBQ sauce reminded me of Bullseye a bit. This one was slightly less smoky. 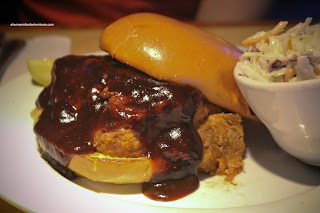 There was probably a little too much sauce for my liking; but no one could accuse the sandwich of being dry or bland. We found the bun to be perfect for this application where it held everything together while still being soft at the same time. The accompanying coleslaw was also pretty good. It had a nice crunch while being balanced between the tart and sweet. 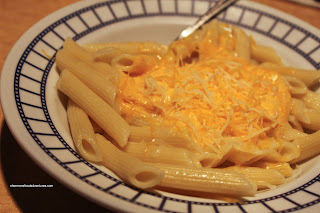 The kids ended up sharing a children's Mac 'n Cheese because they couldn't each finish a whole order by themselves. Thank goodness we didn't get 2 orders because the kid's portion was pretty large. Lots o f almost al dente penne with a Velvetta-type cheese sauce and shredded marble cheese on top. I gave it a try and it was a good diner mac 'n cheese - creamy with plenty of cheesiness (not bland at all as my son exclaimed). Lastly, Viv and I decided to share a slice of Apple Pie a la mode with our daughter. This was a solid apple pie. The crust was very flaky and exactly how I like it. Viv had to remind me of the lard required for this to happen. After that, I stopped raiding the pie (maybe this was intentional to get me to stop). The apple filling was good as well being in big tender chunks and not runny. It was mostly sweet with just a touch of tartness. 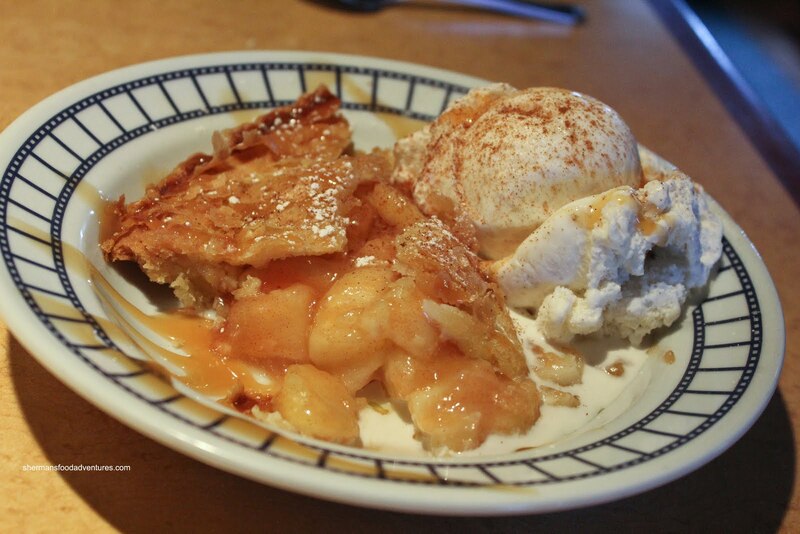 Combined with the hard vanilla ice cream, this was a good apple pie. 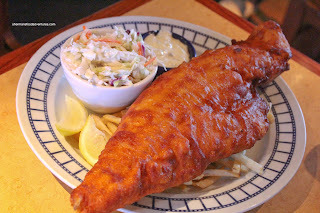 In a moment of "Mijuneness", I took the opportunity to take a picture of the Fish n' Chips from a neighboring diner. It was freakin' huge. And this pretty much sums up the place. The food is plentiful and above-average for this sort of joint. Service was friendly and we had a good time. Nothing to necessarily write home about; yet nothing to really complain about either.